Her body was not to be buried at Warwick, the traditional burial place of her husband’s family, but at Tewkesbury Abbey where her own family, the Despencers, had long been interred. Whilst her husband’s arms were recognised, hers too would be prominently featured, held aloft by two griffins, symbolising the importance of her own personal heritage and her role she had in enriching the Warwick dynasty. Furthermore, Mary Magdalen, that iconic female saint, commanded a central focus in this resplendent vision. Behind this magnificent display of grandeur lay a woman who wasn’t wholly subservient and deferential to a patriarchal world, but a peeress independent in thought and will. It is easy to conclude from the law and medieval theory that in marriage and widhowhood, women were quiet and obedient. The common law made it clear that once married, all a woman’s rights and land were transferred to her husband. With regards to behaviour, even for Christine de Pisan, (the only woman of the time writing for women) it was paramount a wife should ‘humble herself’ towards her husband and ‘obey without complaint’. However, there was a massive disparity between theory and practice – medieval wives and widows could be competent administrators, fiery defenders of their property and ambitious politicians. Whilst husbands were away, either at court in England, or abroad in France where the Hundred Years’ War was raging, women were relied upon to manage sometimes vast tracts of land and large households. Despite the image of deference painted by Christine, she believed women ‘should have all the responsibility of the administration and know how to make use of their revenues and possessions’. This entailed great responsibility for a great many wives. Whilst the bravery mustered at the likes of Agincourt didn’t have to be found, women often had to show their mettle when defending family estates from falling out of control, thus, in 1461 when Bokenham Castle was claimed by the king on behalf of justices of the peace, Alice Knyvet drew the drawbridge and threatened them from a tower ‘I shall defend me, for liever I had in such wise to die than to be slain when my husband cometh home, for he charged me to keep it.’ Knyvet in this instance was successful in persuading her adversaries to turn back, showing the courage women had to show as heads of household when husbands were away. Even when husbands were on home shores, husband and wife could be separated, leading their own households. Such was the case for Elizabeth, Countess of Ulster, who had operated a household comprised of ladies, clerks, esquiers, yeoman of the chamber, pages and a chaplain separate from that of her husband, Lionel, Duke of Clarence in 1357. Widowhood brought a woman a third of all her husband’s lands (dower), and any of those possessions which had been settled on the couple jointly (jointure). She was seized of this land for the rest of her life, whether or not she remarried. Furthermore, her rights under the law were extended, insofar as she could make contracts, transfer land and litigate at court. Margaret de Brotherton, a dowager with royal connections, exemplifies the way a wealthy, ambitious woman could combine the proceeds of marriage with the liberties afforded by widowhood in order to have a clear impact on wider politics. The dower and jointure from her first husband, John, Lord Seagrave and her second, Sir Walter Mauny, combined with her longevity, and the early deaths of some of her children resulted in her amassing land which, by the 1390s provided her with the handsome annual income of 3,000 pounds. 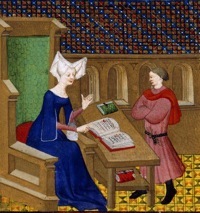 After the death of Mauny in 1372, she used her wealth, connections and independence to aspire to significant political ambitions, styling herself with the one of the great offices of state, ‘countess marshal’ by the 1370s and being addressed as Margaret Marshal by the Crown. By 1397 in recognition of her high repute King Richard II made the unprecedented act of elevating her to the peerage, suo jure, as Duchess of Norfolk. Another slightly more unusual skill in her arsenal is her ability to trace the kinship links between members of European royalty and Lady Jane Grey, no matter how remote. This is testimony to her superb memory for apparently insignificant details in all the lives of her friends, a skill she carries through to her work and which brings a depth to her research that few others have managed. It was only for the most imperious, wealthy ladies that the independence widowhood afforded could have been enjoyed and exploited thus. For many widows, life was a lonely and continual battle for rights over the land and its appurtenances. For Sybil de Fulthorpe, wife of Roger de Fulthorpe, justice of the common pleas, her husband’s exile and subsequent death in 1394, left her with nothing but grief. Until her death in 1414, she used what influence she had to petition the king and fight cases at the county Assizes in order to regain what was rightfully hers. Throughout the 1390s the Crown recognised her great ‘poverty’ and ‘distresses’ and regranted her some of her land and possessions which had been seized due to her husband’s treason. In the next century, she had to fight at the York Assizes from 1403 until 1410 in order to regain her Manor of Schagh in Saddleworth, which had been taken from her control by local families. Although widowhood brought new rights, it also presented difficult new challenges. Apart from for the most elevated ladies, marriage was, for many, crucial to stability. The companionship and support a husband provided was invaluable in the lawless world of later medieval England. Whilst contemporary treatises and law clearly put women in second place, for many, marriage must have proved to be a true partnership. Looking at individuals from six-hundred years ago with largely formal documentation to draw conclusions from can serve to dehumanise the actors of the past. We must look beyond the common law, statutes and treatises in order to envision the lives and roles women played in the later middle ages. In his will, Oliver Leder serves to show us the mutual affection, dedication and love many men must have had for their wives, writing he was ‘very sorye that for her wyse and womanlye governaunce and most loveinge and honest behavior towards me at all tymes sens or mariage, I have nott tenne tymes so much to geve unto her’. Previous postGermaine Greer – Feminist Icon of the Twentieth Century?